Female managers are better than male managers, according to recent findings from Gallup. According to the research firm, females are better able to meet employees' workplace requirements. Despite this, only 33 percent of Americans say they currently have a female boss. Not only are female bosses better able to keep employees engaged, they are more engaged themselves. 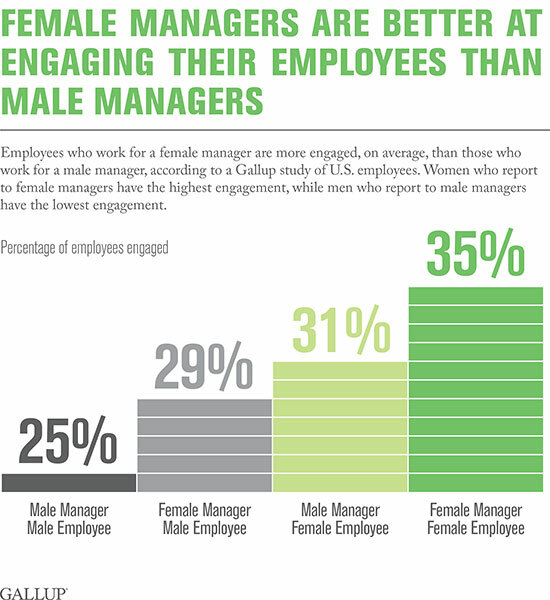 Gallup found that 41 percent of female managers are engaged at work, while 35 percent of male managers are engaged. This remained true regardless of age or if they have children in their household. According to Gallup, management accounts for 70 percent of employee engagement. If female managers are more engaged and more engaging, it's likely that they will better foster a high-performing environment. The research also found that 33 percent of individuals who work for female managers are engaged at work, compared to 27 percent of those who have male managers. Interestingly enough, females who work for female managers are the most engaged (35 percent), and males who work for male managers are the least engaged (25 percent). Gallup measures employee engagement using the Q12, a survey (seen below) that has participants either agreeing or disagreeing with the proposed statements. Through this survey, researchers found that female managers are also more likely to encourage the development of their employees, while checking-in more frequently than male managers on their individual progress. They are also more likely to provide regular feedback in order to help employees achieve their goals. Female managers also provide more recognition for work than male managers. All of these aspects lead to an engaged and hardworking team. Take the survey for yourself and see how your own boss, female or male, does at managing a team.